Students cheer after the announcement that University of Missouri System President Tim Wolfe would resign. University of Missouri System President Tim Wolfe stepped down earlier this week to end a student hunger strike and a strike by the flagship campus’s football team, but his resignation was just one of many demands from students who say the university isn’t doing enough to handle racism and discrimination on the campus in Columbia. Another demand is to increase black representation among University of Missouri-Columbia staff and faculty members to 10 percent by the 2017-18 academic year. The school would have a lot of hiring to do to comply: It would take around 400 more black faculty or staff members to get representation that high. The student group known as Concerned Student 1950, named after the first year that black students were admitted to Mizzou, also wants the university to improve retention for minority students. Black students are less likely than students of other races or ethnicities to stay enrolled in the university after one year and are ultimately less likely to graduate, according to data provided to FiveThirtyEight by the university. 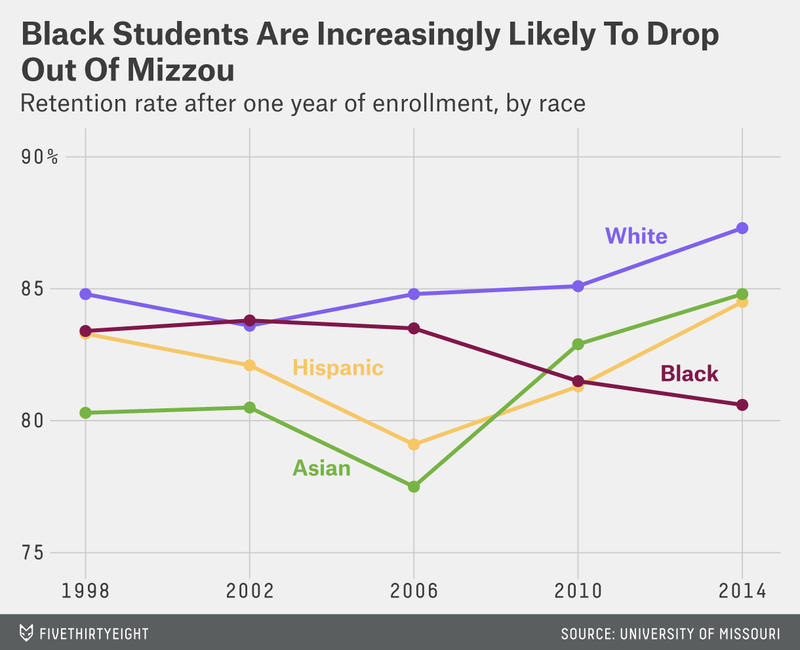 Blacks who enroll at Mizzou are more likely to drop out after one year than they were a decade ago, and graduation rates have consistently been lower for blacks than whites or other minority groups, although both these statistics jump around from year to year. Last year’s six-year graduation rate (so, for students who enrolled in 2008) was 57 percent for black students, compared with 71 percent for white students (though graduation rates for both groups are better than national averages). Across Missouri’s four-year public colleges and universities, blacks made up a slightly smaller percentage of the undergraduate population (12.3 percent) in 2011 than the overall population of 18- to 24-year-olds in the state (13.9 percent), according to a report from an interstate collaboration set up to improve post-secondary education; at Mizzou, 8 percent of undergraduates this year are black. Nationally, black students made up just over 14 percent of undergraduate enrollment in 2013. As the state’s designated land-grant university, Mizzou has the particular mission of providing higher education opportunities for all the state’s residents. Black undergraduate enrollment at the University of Missouri-Columbia is on par with land-grant schools in many Northern states, which have just one, though like most Southern states, Missouri also has a second land-grant school, historically black Lincoln University. While graduation and retention rates are low, the University of Missouri has done a better job than many comparable institutions in enrolling black students. 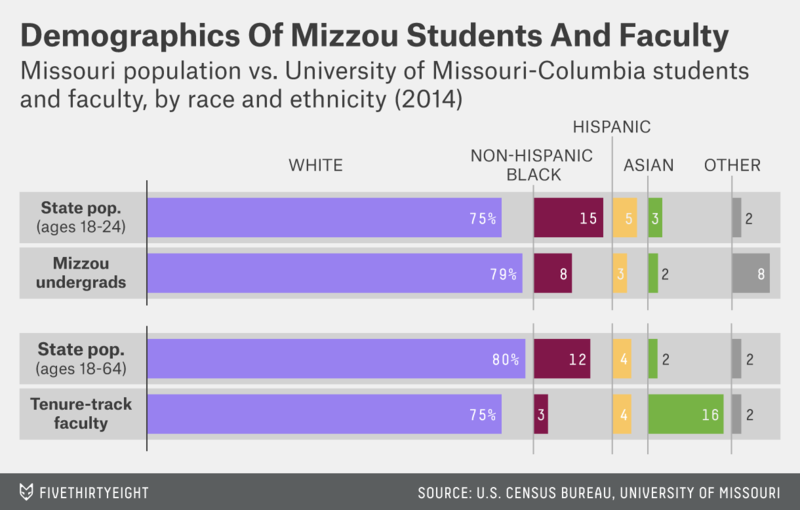 And though the percentages of minority students, faculty and staff at Mizzou have increased over time, blacks are still underrepresented in all of those groups, compared with their overall state population. The disparity is bigger for staff and faculty members. Just 3.2 percent of Mizzou’s tenured and tenure-track faculty are black, compared with 5.2 percent nationally. There is slightly better representation if we look at the staff overall, however: In 2013, 5.7 percent of the total staff and faculty were black (497 out of 8,688 total), according to university data. The highest representation of blacks was among the service and maintenance staff, at 25.6 percent. The next highest was technical/paraprofessional staff, with 6.5 percent. Getting black representation up to 10 percent would require hiring 414 new people, based on the 2013 numbers, or replacing about 370 current staff and faculty. CORRECTION (Nov. 13, 11:32 a.m.): An earlier version of this article misstated the year the student group Concerned Student 1950 asked for black representation among University of Missouri-Columbia staff and faculty members to be raised to 10 percent. The group is asking for that increase by the 2017-18 academic year, not the next academic year.